BALTIMORE, Md. — (June 12, 2015) — Renewable energy provider Wheelabrator Technologies Inc. is celebrating three decades of sustainability and renewable energy generation in the Baltimore region. The Wheelabrator Baltimore facility marked its 30th anniversary last night with a celebration in Baltimore City. Wheelabrator Baltimore uses everyday waste from Baltimore area homes and businesses as a local, sustainable fuel to create clean, renewable energy. Every day, the facility converts up to 2,250 tons of post-recycled waste into 64 megawatts of Tier 1 renewable energy, 55 of which are sent to the local utility—the equivalent of supplying the electrical needs of 40,000 Maryland homes, and the balance of power fuels its operations. Wheelabrator Baltimore also provides steam for the downtown heating loop serving more than 230 customers, including M&T Bank Stadium, home of the Baltimore Ravens, in addition to providing power for homes, offsetting the need for fossil fuels. "As our renewable energy partner, Wheelabrator Baltimore has played a significant role in building sustainable communities in the Baltimore region through environmentally sound waste management practices and renewable energy generation," said Baltimore City Mayor Stephanie Rawlings-Blake. "Over the last 30 years, Wheelabrator has helped our city reduce its carbon footprint while providing Tier 1 renewable energy to tens of thousands of Maryland homes and businesses. Together, we can ensure that we are making the best choices for a sustainable future, and that starts right here in our own city where we convert waste to energy." The facility, which began operations in 1985, is a major partner in the city’s revitalization. The facility uses local waste as fuel to create energy, recycle metals, reduce the need for landfills, and lower carbon emissions. Through the energy-from-waste process, the facility creates a local-energy ecosystem where consumers supply the energy for the power and steam they use. "Together with Wheelabrator, Baltimore County is working to create and maintain sustainable communities and preserve our environment for the next generation of Baltimore area residents," said County Executive Kevin Kamenetz. "Wheelabrator plays a critical role in reducing the amount of waste we send to our landfills, while generating electricity for our residents that offsets our need to use fossil fuels." Processed over 21 million tons of municipal solid waste — enough to fill over 1 million tractor-trailers, which if lined up end to end, would span the width of the U.S. (Baltimore to San Diego) more than five times. Generated nearly 9 million megawatts of electricity — enough electricity to power all residential homes in the U.S. for more than two days. Recycled over 400,000 tons of ferrous metals — enough steel to build 57 Eiffel Towers. Most recently, Wheelabrator Baltimore installed equipment for recycling of non-ferrous metals, recovering over 1,000 tons in the first eight months of operation, equivalent to 64 million soda cans, which, if lined up end to end, would stretch for 5,000 miles. The company directly employs 71 Maryland residents – 75 percent of whom live in the Baltimore area. Wheelabrator indirectly supports an estimated 175 additional jobs in transportation and support services that are connected to the facility. Between payroll, purchases of goods and services, and tax payments, Wheelabrator contributes an estimated $50 million in economic activity annually to the city, county and state. "Combined with the city's increased recycling efforts, which divert items from the waste stream, creating energy-from-waste is another solution for Baltimore," said Baltimore City Department of Public Works Director Rudy Chow. "We deliver approximately 175,000 tons of waste to the facility annually, which helps heat portions of downtown Baltimore with steam and supplies enough electricity to power thousands of Baltimore-area homes. The Department of Public Works is glad to be a long-time partner with Wheelabrator Baltimore, and congratulates the company on its 30th anniversary." 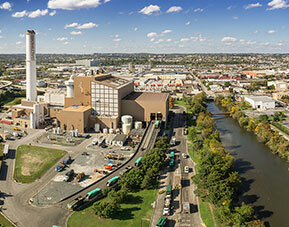 "For 30 years, we have been proud to help the Baltimore-area communities convert their post- recycled waste into a clean, renewable energy source and recover valuable materials from the waste stream, reducing our dependence on fossil fuels and preserving natural resources for the future," said Mark Weidman, Wheelabrator Technologies President & CEO. "We look forward to continuing the innovative partnership with our host City of Baltimore, Baltimore County, the Northeast Maryland Waste Disposal Authority and our long-term customers in the private sector that choose to bring their post-recycled municipal and business waste to the facility. We also salute our employees for their commitment to safety and operational excellence, which has made our plant an environmental and economic asset to the region." Headquartered in Hampton, New Hampshire, Wheelabrator creates clean, renewable energy from everyday residential and business waste. Wheelabrator has a current platform of 16 energy-from-waste facilities, four independent power-producing facilities, four ash monofills and three waste transfer stations. Wheelabrator has an annual waste processing capacity of over 7.4 million tons, and a total combined electric generating capacity of 768 megawatts — enough energy to power more than 645,000 homes. Wheelabrator facilities also recover metals from ash for recycling into commercial products. The company also operates two combined cycle gas facilities with a combined energy capacity of 1,482 megawatts. For more on Wheelabrator, please visit www.wtienergy.com.